In August, the rural community’s city council voted to present the option to reclaim local authority to voters this fall. The town is located in about 45 miles southwest of Colorado Springs and draws tourists interested in rock climbing and whitewater rafting on the Arkansas River. Tourism is important to Cañon City’s more than 16,000 residents, but city leaders see the value in diversifying. With county seat Cañon City as the most populated community, Fremont County is primarily rural and located in the center of the state. Within the county there are more than 1,500 square miles, which includes two National Forests, a National Wilderness, and several other protected areas. Approximately 47,000 people live in Fremont County. In addition to the tourism that helps prop up Cañon City’s economy, Fremont County is known as home to several state prisons. In early July, the Board of Commissioners voted unanimously to present the opt-out measure to the voters this fall. For many communities in Colorado that have taken up and chosen to opt out of SB 152, one of the primary reasons voters choose to reclaim authority has little or nothing to do with their interest in municipal broadband. Many people in Colorado feel that most decisions should be made on the local level. Rather than let Denver dictate how they get access to broadband, they vote to bring the decision back to the towns where people know what they need. Considered part of the Denver metro, Aurora’s population rests at around 362,000 people. Over the past few decades, it has grown quickly and is now Denver’s largest suburb. It covers almost 154 square miles and it the third most populous city in the state. Buckley Air Force Base employs more people than any other single entity in the community at more than 12,000 people. Other large employers include Anchutz Medical Campus, the University of Colorado Hospital, and the Aurora Public Schools. Healthcare, including insurance, and defense contractors. At their July 23rd city council meeting, members decided to allow voters choose whether or not to reclaim local telecommunications authority by opting out of SB 152. The council considered a memo drafted by a Denver law firm that suggested taking advantage of the opt out provision before any changes in state law might make it more difficult for local communities to improve local connectivity. Attorneys also noted that the number of communities who have chosen to opt out has increased every year, allowing them the flexibility that Aurora doesn’t share until they do the same. Aurora's council voted unanimously to give voters the chance to reclaim local authority on the November ballot. 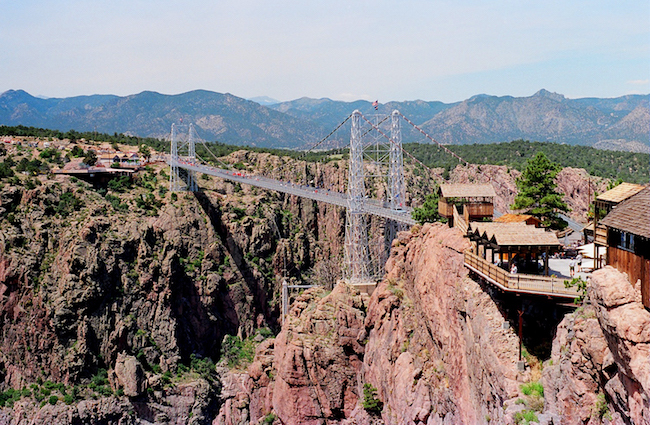 Photo of Royal Gorge Bridge at Cañon City by Larry D. Moore [CC BY-SA 3.0 or GFDL], via Wikimedia Commons.